Remove and clean one wheel at a time. Slightly loosen the lug nuts on one wheel, and jack one end of your car off the ground (preferably the end with the wheel you want to remove). Before fully loosening the lug nuts and removing the wheel, place a jack stand under an appropriate point of the chassis or suspension. Clean the back side of the wheel first. Spray the back side of the wheel and tire with a generous coat of wheel cleaner. Allow it to soak for 3 to 5 minutes. Using your Tuf Shine Tire Brush and McKee's 37 Tire & Rubber Rejuvenator - scrub the front and back side of the tire. Rinse off the grunge and repeat until no more dirt is being pulled out when scrubbing. After cleaning the tires, use the Speed Master Wheel Brush and Wolfgang Uber Wheel Cleaner clean the entire rim's face, lip and inner barrel. Rinse thoroughly and repeat. If your wheels have small crevices, you may need to use the Famous Detailing Brush. The brush also works great for cleaning around the lug nut openings. After letting the cleaner dwell, use your wheel brush to scrub the wheel well, brake caliper and suspension parts. The goal here is to remove the majority of the built up grime, you don't need to make it perfect unless you really do plan to show your car. Let these parts air dry. Spray the underside of your wheel well and any plastic parts with a generous coating of Sonus Trim & Motor Kote. This protectant prevents from snow from accumulating in your wheel wells (no more snow bunnies!). It also makes future cleanings much easier. Wipe off the excess dressing with a towel, and buff to a nice luster. Wipe your tire down with a generous coating of McKee's 37 High-Gloss Tire Gel and allow it to penetrate. While the dressing soaks in, inspect the wheel for tar spots. 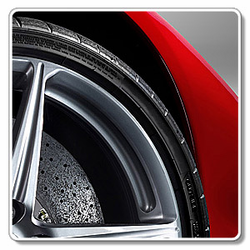 Inspect your wheel for surface scratches. If you find any, now is the time to buff them out with a light polishing compound. Wax your wheel front and back. McKee's 37 Wheel Glaze is made just for this purpose. Finally, buff the tire and apply a second coat of tire dressing. When you are satisfied with the finish, put the wheel back on the car. There is a significant amount of work involved in achieving concours tires and wheels. If you plan to show your car, removing the wheels to detail the wheel wells, tires and wheels is a must. If you don't plan to show your car, creating concours tires and wheels is still a great way to show off your car. Exclusive formula makes engines, wheel well liners and plastic cladding look new! Lasts months, not days!